The study will be conducted in Aba'ala district in the Zone two of Afar regional state in Ethiopia, among the Afar, the second largest pastoral community in Ethiopia. Spatial and temporal climate variability is a characteristic feature of the Afar landscape. Climate and its variability is very important in Afar pastoralists' livelihoods that traditionally the Afar have meticulous seven season calendar identifying exact dates and localities of rainy periods including rainy periods of Segum, Karma, Konayto, Datrob, Debaba, Zeza’e, and Gilal. A common Afar proverb- "Rain discriminates between two horns of an ox'' also indicates how Afar emphasize the importance of spatial climatic variability. Afar have three words: "Abara", "Adalsa" and "Hagaya" describing different temporal subtleties of droughts. 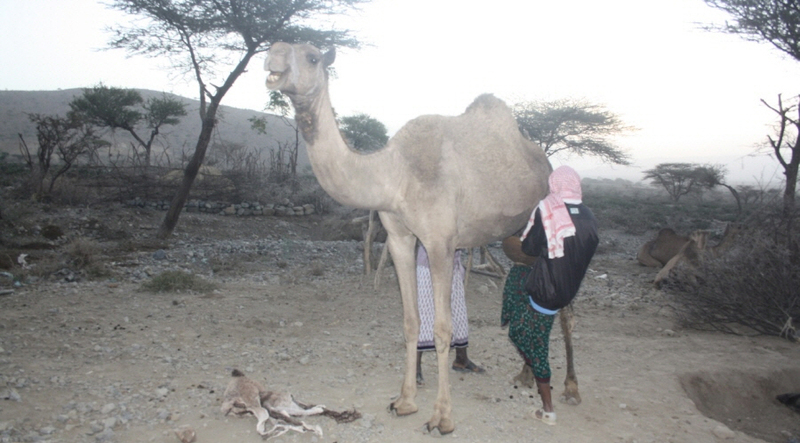 While these traditional weather calendars and systems, involving climate foretellers, have been very important in guiding the pastoral livestock production system in Afar, increased climate variability and recurrence of drought have made the Afar to develop variants of these systems and seek support from other sources such as the formal climate information system. However, since most Afar households have no access to updated formal weather information and many cannot effectively interpret it, the traditional systems are still important. © Photo: Mulubhran Gebremikael. Storing water in traditional water containers made of goat and sheep skin is practiced as a response to traditionally predicted drought. This project will document and appraise a locally pertinent knowledge system, and by doing so, will help in its integration with formal climate knowledge system for the development of a locally relevant climate information and adaptation policy. The methods to be used will include focused group discussions, individual interviews, and case studies involving clan leaders, elderly women, 'Edo' scouts (traditional rangeland scouts experienced in assessment of rangeland condition and weather), traditional weather foretellers (magicians) and Adda elders (customary leaders), and ordinary pastoral households. The researcher is an assistant Professor at Mekelle University in Ethiopia and has over a decade of experience working with Afar pastoralists. His previous publications include Encomium of the Camel: The Oral Sung Poetry of the Afar Pastoralists of Ethiopia.